You Need Something. More Self Care. Want to know what most online business owners don't take time to do? Practice self care. It's easy for us to put it off when we're busy trying to hustle our way to success. But it's not ever in your best interest to skip out on that. Oh no. In fact, you need to be practicing self care in order to really make the most of your business and your life. Don't believe me? Don't take my word for it! This week we're chatting with Ericka Eller and she's totally got my back here. And more importantly, she's got yours. 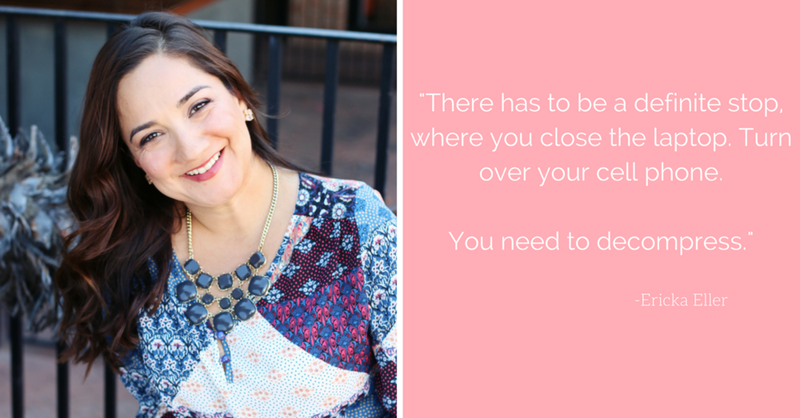 Ericka is a wife and mom of 3, a career woman, and an entrepreneur. She understands the struggle women are faced with to manage all the things all the time and still find time to be healthy. She has a passion for sharing with other career-minded women the best ways to manage stress and maximize success. You can find this incredible wellness coach over at ErickaEller.com. Self care is so so necessary. And yet when we're working online, or working at all, we struggle with remembering to take time to step away and take care of our minds and our bodies. But that leads to nothing but burnout and exhaustion. Women are chronic yes people. We have a hard time saying no but saying no is absolutely one of the best things we can do for ourselves. We keep from burning ourselves out but also from having the stress of wanting to be perfect when we're at our wits ends. If you're not seeing the people you love because of work... well, friend, it's time to do some soul searching. Sleep. Dear friend. You need sleep. This doesn't make you weak, it doesn't make you less of a "hustler," it makes you human. And for the love of all things holy, let's drop the hustle mindset. Because you're amazing and you don't need to drink the hustle koolaid! Self care isn't something you can just brush off as an entrepreneur. It's something that is absolutely vital to your business growth! Here this chat with wellness coach Ericka Eller to find out why.